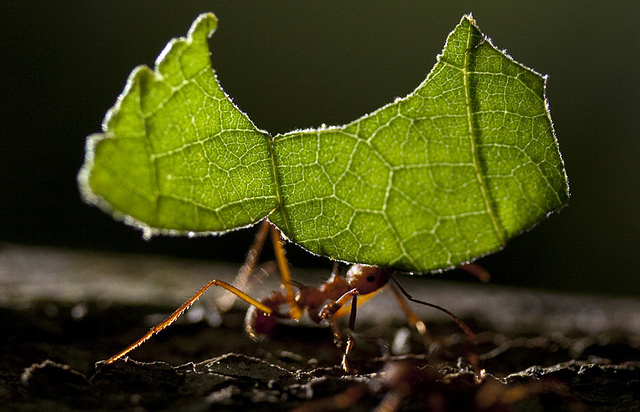 Known for carrying green leaves as they march through tropical forests, leafcutter ants also cultivate underground gardens of fungi and bacteria. New PNNL research about the roles bacteria play in those gardens could eventually help scientists turn plants into biofuel. Photo courtesy of Alejandro Soffia Vega. 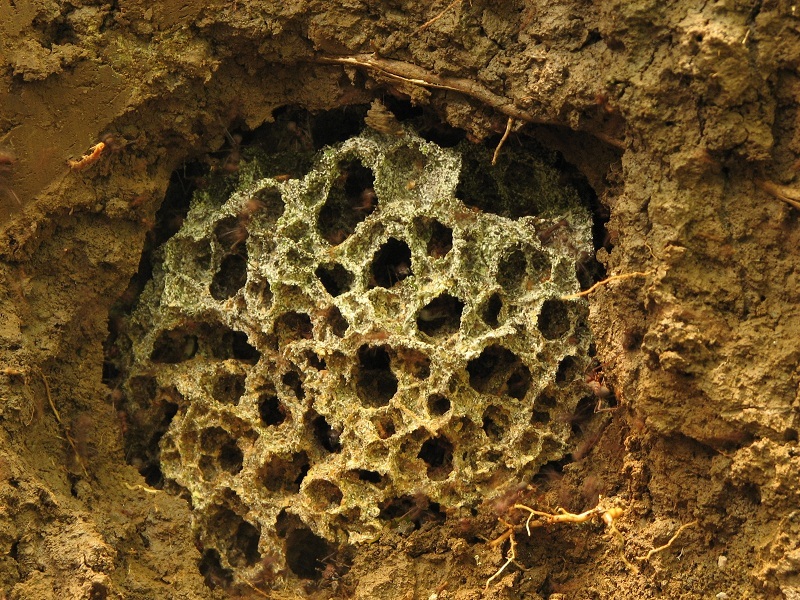 Leafcutter ants cultivate underground gardens of fungi and bacteria such as the fungal garden pictured here. Photo courtesy of Jarrod J. Scott, University of Wisconsin-Madison. RICHLAND, Wash. — Leafcutter ants, the tiny red dots known for carrying green leaves as they march through tropical forests, are also talented farmers that cultivate gardens of fungi and bacteria. Ants eat fungi from the so-called fungal gardens, but the bacteria's role has been unclear until now. New research shows the bacteria help decompose the leaves and play a major role in turning the leaves into nutrients that may be important for both ants and fungi. The findings were published March 1 by The ISME Journal, a publication of the International Society for Microbial Ecology. "This research provides some of the first tangible details about the fascinating symbiotic relationship between leafcutter ants, fungi and bacteria," said Kristin Burnum, a bioanalytical chemist at the Department of Energy's Pacific Northwest National Laboratory. Burnum is a co-author on the paper and led the study's protein analysis. "Understanding how bacteria turn plant matter into a source of energy in ant fungal gardens could also help improve biofuel production." The gardens in question are initially sowed by the ants, which bring leaf pieces into their underground nests. From the leaves grow the fungus Leucoagaricus gongylophorus, traditionally thought of as the ants' food. The relationship between leafcutter ants and fungi has been known since 1874, but it wasn't until the late 1990s that scientists started to also identify bacteria in the underground gardens. Since then, a lively debate has gone on about the bacteria's role. Because pure samples of the garden fungi grown in laboratories don't easily degrade cellulose, a molecule that gives plants structural stability, many scientists have argued the bacteria help decompose the leaves. Other researchers have proposed bacteria — like the microscopic bugs in our guts — help ants obtain nutrients from the leaves. Lead author Frank Aylward of the University of Wisconsin-Madison, Burnum and their co-authors set out to help resolve the debate by doing a comprehensive survey of the various bacteria species that live in the gardens and examining the suite of proteins those bacteria produce. They traveled to a Smithsonian Tropical Research Institute site near Gamboa, Panama, and gathered samples of fungal gardens tended by two ant species, Atta colombica and Atta cephalotes. Aylward and several others on the research team are part of the Great Lakes Bioenergy Research Center, one of three Bioenergy Research Centers established by DOE's Office of Science in 2007 to accelerate research toward the development of cost-effective advanced biofuels from nonfood plant fiber. The University of Wisconsin-Madison leads the Great Lakes center. To produce results that more accurately reflect the large diversity of real-world gardens, the team collected large samples with bits of leaves, ants, fungi and bacteria intermixed instead of just gathering samples of the bacteria they intended to study. This allowed them to better examine the entire community of bacteria that live in the gardens and prevented them from missing some bacterial species. The team then studied the bacterial community's genes and proteins - an approach known as metagenomics and metaproteomics. The researchers sequenced their genetic samples at Lawrence Berkeley National Laboratory's DOE Joint Genome Institute. With the help of an extensive library of bacterial genes developed by co-author Cameron Currie, team members at University of Wisconsin-Madison identified thousands of bacterial genetic sequences from the two ant gardens. More than two-thirds of the bacterial species found were from just a few groups. More than half of those identified belong to the family Enterobacteriaceae, whose members are known to ferment sugars and include the intestinal microbes that help animals digest food. From the bacteria, Burnum and her PNNL colleagues in Richland examined proteins, the workhorses of the cell that perform the tasks needed to keep organisms alive and well. They used mass spectrometers at EMSL, the Department of Energy's Environmental Molecular Sciences Laboratory at PNNL, to identify proteins in an A. colombica nest. Breaking down complex sugars that make plants tough and durable, but difficult to digest. Transporting sugars, allowing broken-down sugars to be used for energy. Making amino acids, the buildings blocks of proteins. Making vitamin B5, which is needed to both break down proteins, carbohydrates and fats and to make energy from nutrients. When compared to all other bacteria in Currie's large library of bacterial genes, very few — just 0.2 to 0.6 percent — of the garden bacteria were involved in breaking down cellulose. Instead, most of the garden bacteria were involved in breaking down simpler sugars, indicating that perhaps fungi initially breaks down cellulose and the bacteria then turn the partially digested sugars that result into a variety of nutrients that could promote the fungi's growth or even nourish the ants themselves. "Our results show that calling these 'fungal gardens' is pretty misleading; 'fungus-bacterial communities' would be far more accurate," Burnum said. "Bacteria are not only integral residents of these communities, but they perform essential tasks that keep the communities - and the ants that help cultivate them - living." Next, the team plans to analyze the fungi, lipids and various metabolic products found in the gardens. This study's findings and future results could advance the work of scientists who are looking at fungal enzymes to make biofuel out of plants. The enzymes, or biological catalysts, of fungi are exceptionally talented at breaking down cellulose in plants, making them a good model for large-scale biofuel production. "It's apparent that neither fungi nor bacteria work in isolation when it comes to leafcutter ant gardens," Burnum said. "It's possible that the same goes for biomass conversion; perhaps both fungi and bacteria are needed to efficiently turn plants into biofuel." REFERENCE: Frank O. Aylward, Kristin E. Burnum, Jarrod J. Scott, Garret Suen, Susannah G. Tringe, Sandra M. Adams, Kerrie W. Barry, Carrie D. Nicora, Paul D. Piehowski, Samuel O. Purvine, Gabriel J. Starrett, Lynne A. Goodwin, Richard D. Smith, Mary S. Lipton, Cameron R. Currie. Metagenomic and metaproteomic insights into bacterial communities in leaf-cutter ant fungus gardens. The ISME Journal, Online publish date March 1, 2012. DOI: 10.1038/ISMEJ.2012.10. www.nature.com/ismej/journal/vaop/ncurrent/full/ismej201210a.html. DOE'S Office of Science is the single largest supporter of basic research in the physical sciences in the United States, and is working to address some of the most pressing challenges of our time. For more information, please visit science.energy.gov. The Joint Genome Institute and EMSL are also supported by the Office of Science.